I almost didn’t make this video. In truth, I almost didn’t make any video at all today – or tomorrow – or the next day – or however long it might take to get rid of my latest ‘problem’. My first thought about going before the camera at all, let alone uploading the fruits of my labour on to Youtube was acute embarrassment. You see I’ve developed a rather nasty little rash, courtesy of an interesting brand of fabric conditioner that doesn’t seem to agree with me. Yes, it’s fine – I’ve been to the pharmacy, collected a nice little box of antihistamine tablets and some soothing gel for my burning skin. I’m not going to die from this and it’s likely to be cleared up in a week or two. But that’s not the point. Ironically I uploaded a video recently about care plans and how we tend to give up too early when things get a bit difficult. In that video I challenged all those who saw it to apply the same principles to their own life and see how often they’d have been given up on themselves as they struggled to overcome the obstacles that life inevitably throws before us all. I encouraged people not to give up on their service-users just as they don’t give up on themselves. And here was I seriously considering doing just that. And for what? Because of a little bit of embarrassment about an allergic reaction to a perfectly ordinary part of life – laundry. Since I started making these Youtube videos in earnest about a month ago I’ve set myself the target of producing at least 2 videos each week. That might not sound a lot but when you’re working full time and travelling to and from home in another part of the country the opportunity soon disappears if you let it. But that was the goal I set myself and that’s the goal I intend to keep. It’s my little care plan for myself, if you like. I’ve long believed that in health and social care we must at least try to practice what we preach. We won’t always manage it but we should give it a go. 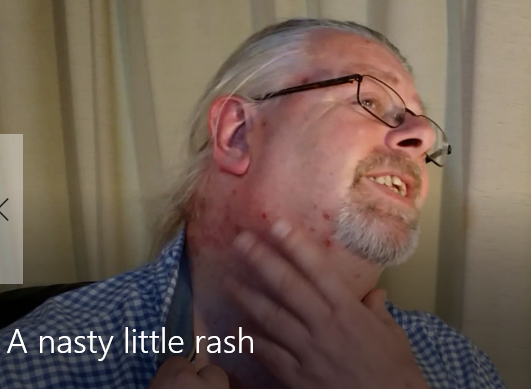 If my service-user had wanted to use a non-serious rash like this as a reason not to push themselves I’d have bent over backwards to encourage them to carry on with the plan we’d agreed. I’d come up with lots of arguments about how nobody really cares what other people look like, no matter how awkward we might feel ourselves and how there’s no reason to let the few small-indeed people who did judge them spoil their achievement of their personal goals. I’d remind them that most people who saw them would be strangers who they’d probably never see again and how those that did know them would understand. Most of all I’d point out that they have a positive momentum and that’s a good thing. Positive momentum is worth a lot to peoples’ welfare and well being. I’d say all that because I believe it. I believe in change and the potential for all people to grow beyond their current limits when given the right opportunities. So I have to behave the same way myself. I have to grit my teeth, accept emotionally what I know to be true intellectually and get in front of this camera, rash or no rash. And here I am. So that’s my message for today – don’t worry what small-minded others might think. Keep the momentum of positive change going and never, ever let other peoples’ attitudes keep you from pursuing what’s right.